Welcome everyone! Today is another Joint Blog Hop and its a colour challenge this week! I wasn’t too sure about the colours but guess what, its actually a pretty combination and the only extra colour I used is black for the sentiment. This week I used the new Serene Garden stamp set. Its such a pretty whimsical set! You know me! I like to change things up! Here’s how I created the card. I used water colour paper cut down to 2-3/4″ x 3-7/8″. I started with the larger flower arrangement in the set and used the Stamparatus for this step. Concentrate on the the flower arrangement that has the long leaves shaped like a ‘V’. Place on the panel slightly centred and close the stamparatus panel on it. With Pear Pizzazz Stampin’Write Marker, colour the outline of the long leaves and stamp on the watercolour panel. 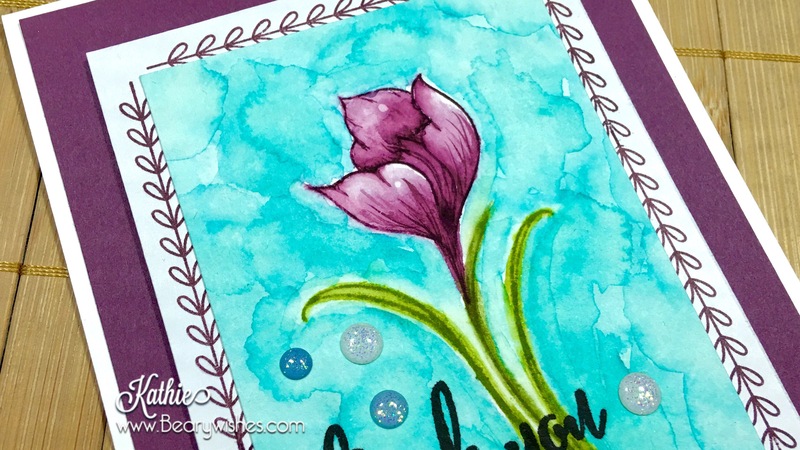 Using the larger flower stamp in the set, place it on the watercolour panel and centre it on the ‘V’ shape and close the stamparatus panel on it. 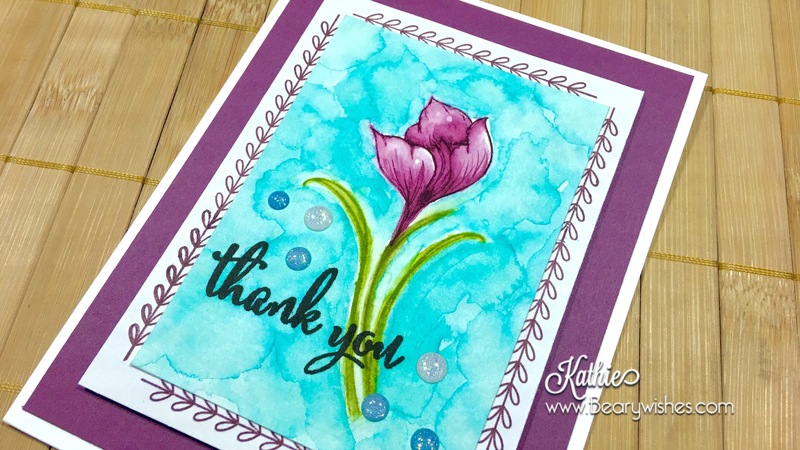 With Fresh Fig Stampin’Write Marker, colour the outline of the flower and stamp the image. Next lay down some Fresh Fig and Pear Pizzazz on an acrylic block and used an aqua brush and carefully colour the leafy sections and the flower. On the flower concentrate in the lower section to get it darker then the other parts of the petals. Let the piece dry for a bit and lay down more colour and lighter towards the petals. Once dried, add a bit of Fresh Fig on the tip of the aqua brush and add thin veins on the petals to create details. For the background, I used Bermuda Bay Stampin’Write Marker. I wet sections of the panel and picked up the colour and swirled around to create the watermarks. Continue until the panel is covered. Be careful around the edge of the flower image. If I was to create the image again I would fade out towards the edge for a slightly different look. Now onto the card layout. I eye balled this next part. I used the long tiny leafy stamp and stamped along the edge on all sides in Fresh Fig. Centre the watercolour panel and adhere to the white panel. Next, cut down a Fresh Fig panel to 4 x 5-1/4″ and adhere onto a top folding card base 4-1/4 x 11″ -Scored at 5-1/2″. I added dimensionals to the back of the leafy border panel to raise it and adhere it to the Fresh Fig panel. The sentiment is from the Love What You Do stamp set and stamped with Memento Black Ink. Lastly, I added a bunch of Glitter Enamel Dots to finish off the card. It didn’t take that long to make and I had a lot of fun creating it!! I Hope you enjoyed todays card share. So pretty! Your flower is just gorgeous, Kathy!! Lovely card. Your watercoloring is great. You did wonderful around the flower. I would be getting it on the flower. Stunning! YOU ARE AN ARTIST. Beautiful flower. Love the framing too. May have to CAS this one. Oh my…this is fabulous….love the brightness and the background. Kathie, this is sooooo beautiful! Your watercoloring is simply AMAZING!! !